While Door County positively bustles with activity during the summer months, this tiny community of just 28,000 people scattered across 2,370 square miles reverts back to its rural roots during the winter. Many resorts, restaurants, and other businesses close their doors to the cold, leaving full-time residents and families to cope with the realities of a boom-or-bust economy. David Eliot has been chipping away at the question how to create a more sustainable way of life in Door County since he founded Peninsula Pulse, a weekly arts and culture newspaper, in 1996. Friend and colleague Myles Dannhausen, who began working with Eliot at Peninsula Pulse at age seventeen as a reporter and later a features editor, says the two have always felt that many see Door County only through the lens of tourism. Hoping to change perceptions about the Door, in 2015 Dannhausen and Eliot teamed up with local filmmaker Brett Kosmider to create Peninsula Filmworks, a web video production company dedicated to discovering the stories that give Door County depth and purpose. As digital film technology became more affordable, and the media by which short films are shared has exploded, the three began to refine their craft. For instance, one video shows how Brian Fitzgerald established a burgeoning hockey culture on the peninsula by building a rink in Sister Bay and bringing people together for the annual Door County Pond Hockey Tournament. Another video features interview with Jess Holland and Nick Hoover, better known as the local band Deathfolk, and captures their blissful harmonizing over twangy folk music sound. Perhaps most emblematic of what Dannhausen, Eliot, and Kosmider are trying to do with Peninsula Filmworks is a video short featuring a seminal moment in regional craft beer culture (see above image). 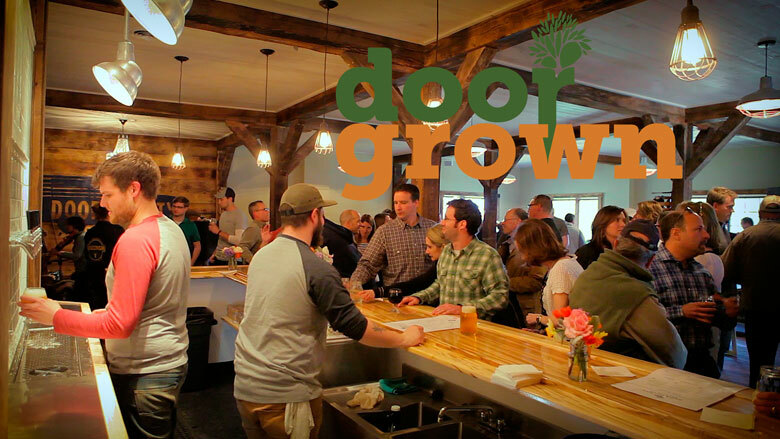 The establishment of Door County Brewing Company by John and Angie McMahon County underscores the importance of both industry and family for Door County. The McMahons founded the brewery in early 2013 in part to bring their sons, Ben and Danny, back home to Door. Today, the McMahon family’s seven-barrel system is producing Belgian-style ales like Le Printemps and L’Automne out of their brewery/restaurant in Baileys Harbor. Elliott Puckette is a former editorial assistant for Wisconsin People & Ideas.